Primary School Head Master Circular 2017 & rules published on 23 May 2017. 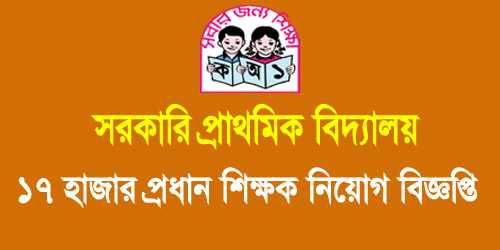 The government is appointing 17,000 head teachers of the government primary school in Bangladesh. The appointing head teachers from the current charge of teacher around 17,000 government primary schools across the country. These institutions are not currently the head teachers. These posts are being given the responsibilities of assistant teachers. www.dpe.gov.bd update the details circular as soon as possible. Finally the problem solve on May 23 (Tuesday) 2017. Primary and Mass Education Minister Advocate Mostafizur Rahman Fizar told the reporters after the meeting with the leaders of the Primary Teachers Association. The meeting was held in the primary and mass education ministry. There are currently 64 thousand 820 government primary schools over the country. Of these, there are 21 thousand head master post is blank of those school. According to the teacher employment policy 35 percent of the total vacant posts are directly and 65 percent are to be filled up. The number of posts promoted to 65 percent is more than 17 thousand. Some of the people is not like to the appointment system for Primary School Head Master Circular 2017. They hope, Govt published new circular for appointment Head master post. But Govt decide, they take the head master from the current charge of the teacher. So in this case, some teachers are happy to get the full charge of headmaster post. I think most of the people are not like the appointment system 2017. The leader of the Primary Teacher’s Association filed a lawsuit against the promotion of the post of Head Master. And that’s the reason to stop the appointment of the head teacher in so many years. Primary and Mass Education Minister told reporters that. According to the seniority we are taking the responsibility. These teachers were given posting in promotional posts. Since the absence of the head teacher, the schools are not running. The quality of the education is bad and the problem of school management is being done. So senior assistant teachers are being given the current responsibility. He said no such appointment was being made so many cases including the case. It may be mentioned that the Leader of the Primary Teachers Association filed a case against the promotion of the post of teacher. The meeting with them on Tuesday. Ministry Secretary Mohammad Asif-uz-Zaman, Additional Secretary Nazrul Islam Khan, Giasuddin Ahmed. Director General of Primary Education Department. Abu Hena Mostafa Kamal were also present. On the other hand, Bangladesh Primary Teachers Association President Atiqur Rahman and General Secretary Abul Bashar and others were present. The public education minister said, the promotion from the seniority list of teachers received from 12 districts is now being promoted. If there is a list of teachers’ grades from other districts. Then there will be the current charge of Assistant teachers in the vacant posts of the headmaster. Contrary to the vacant posts of Headmaster. I want to start with Dhaka district. After the announcement of the minister. 87 people have been given the responsibility as head teacher on Tuesday. This circular not need to application from new applicants. This primary school head master circular 2017 is only for current in charge of the teacher. The should be inform officially by government. So details information send by postal how to apply primary school head master circular 2017. It is learned that in 2014, the head teacher’s post was upgraded from third to second grade. In this post, the promotion of the PSC is to be promoted. In the existing employment rules, due to the third grade of the head teacher, due to the revision of the ordinance.